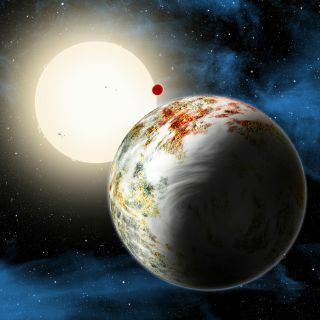 An artist's illustration of the mega-Earth planet Kepler-10c, the"Godzilla of Earths" planet that is 2.3 times the size of Earth and 17 times heavier. The planet and its lava-world sibling Kepler 10b (background) orbit the star Kepler-10 about 570 light-years from Earth, in the constellation Draco. Image released June 2, 2014. BOSTON — Scientists have just discovered the "Godzilla of Earths" — a new type of huge and rocky alien world about 560 light-years from Earth. Dubbed a "mega-Earth," the exoplanet Kepler-10c weighs 17 times as much as Earth and it circles a sunlike star in the constellation Draco. The mega-Earth is rocky and also bigger than "super-Earths," which are a class of planets that are slightly bigger than Earth. "This is the Godzilla of Earths!" the CfA's Dimitar Sasselov, director of the Harvard Origins of Life Initiative, said of Kepler-10c in a statement. "But unlike the movie monster, Kepler-10c has positive implications for life." The discovery of Kepler-10c was presented today here at the 224th American Astronomical Society meeting. The mega-Earth orbits its parent star once every 45 days. Kepler-10c is probably too close to its star to be hospitable to life, and it isn't the only orbiting the yellow star. Kepler-10 also plays host to a "lava world" called Kepler-10b that is three times the mass of Earth and speeds around its star in a 20-hour orbit. NASA's Kepler space telescope first spotted Kepler-10c, however, the exoplanet-hunting tool is not able to tell whether an alien world it finds is gaseous or rocky. The new planet's size initially signaled that it fell into the "mini-Neptune" category, meaning it would have a thick envelope of gas covering the planet. CfA astronomer Xavier Dumusque and his team used the HARPS-North instrument on the Telescopio Nazionale Galileo in the Canary Islands to measure Kepler-10c's mass. They found that the planet is, in fact, rocky and not a mini-Neptune. "Kepler-10c didn't lose its atmosphere over time. It's massive enough to have held onto one if it ever had it," Dumusque said in a statement. "It must have formed the way we see it now." Scientists think the Kepler-10c system is actually quite old, forming less than 3 billion years after the Big Bang. The system's early formation suggests that, although the materials were scarce, there were enough heavy elements like silicon and iron to form rocky worlds relatively early on in the history of the universe, according to the CfA. "Finding Kepler-10c tells us that rocky planets could form much earlier than we thought," Sasselov said in a statement. "And if you can make rocks, you can make life." The new finding bolsters the idea that old stars could host rocky Earths, giving astronomers a wider range of stars that may support Earth-like alien worlds to study, according to the CfA. Instead of ruling out old stars when searching for Earth-like planets, they might actually be worth a second look. It's also possible that exoplanet hunters will find more mega-Earths as they continue searching the universe. CfA astronomer Lars A. Buchhave "found a correlation between the period of a planet (how long it takes to orbit its star) and the size at which a planet transitions from rocky to gaseous," meaning that scientists could find more Kepler-10c-like planets as they look to longer period orbits, according to the CfA.